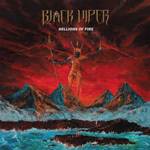 Black Viper are a speed metal band from Norway formed as a solo project in 2013 by Deathhammer drummer Cato. By 2016, Cato had got a band together and released the demo 'Storming With Vengeance'. The bands debut full length offering 'Hellions Of Fire' was released in 2018. ...followed by the Angel Witch sounding 'Suspiria', although Angel Witch (NWOBHM icons) were never this fast! Clocking in at under five minutes, 'Suspiria' is an explosive blast of fury, a head bangers dream and is a breathless barrage of speed and power. Pace does not abate one iota as 'Freedom's Reign' explodes into life. Heavily influenced by the iconic NWOBHM sound, 'Freedom's Reign' is fast, furious and highly energetic. Every song on the album has been lively, fiery and played at an extremely high pace, and without even realising how far time has travelled, the final song is heading out of the horizon. 'Nightmare Mausoleum (The Sleeper Must Awaken)' is an epic eight minutes plus in length and keeps the blistering pace of the album going. Furiously full tilt, 'Nightmare Mausoleum (The Sleeper Must Awaken)' is a fabulous ending to a cracking album, an album that sets the earth on fire as it scorches along at a stunningly high speed. Overall, fast paced, blistering speed metal with a heavy NWOBHM influence, 'Hellions Of Fire' is a head bangingly infectious "foot on the monitor" rampage.